Persimmon is a quintessential fall and winter fruit, and when properly ripened is as sweet as candy. I bought these 7 days before making this salad and they were slightly soft already. I left them in my refrigerator in a paper bag and they continues to ripen until they were almost custardy. It’s best to ripen them in natural daylight and then put them in the frig when they’re ready. These were so ripe, I had to slice them very carefully. The beautifully soft texture went perfectly with the crunchy walnuts, tart pomegranate and bright orange flavors. The dressing is a nicely balanced vinaigrette with a hint of maple and ginger. High in vitamins like vitamin A, beta carotene, lutein and lycopene which are known for fighting pre-mature aging. Great for your metabolism with a rich array of B vitamins, like folic acid and thiamin. Known to boost immunity, with a high level of vitamin C.
High in fiber which is great for digestion. One serving contains almost 20% of the RDA! 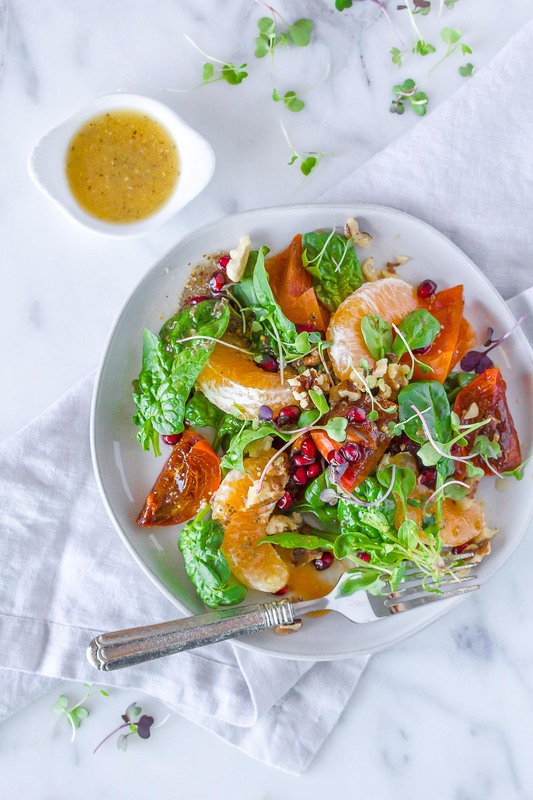 Fresh and fruit filled winter salad, with a delicious orange ginger dressing! To make the dressing, whisk together all the ingredients and allow to sit for 15 minutes for the chia to thicken. Set aside until ready to use. To make the salad, arrange the spinach on 2 plates. Top with the persimmon wedges, orange wedges, raw walnuts, pomegranate seeds and sprouts. Drizzle with some of the dressing.